AND…We Passed 4,000 Hits on My Blog!! …so, look for a guest article from Carissa Davis…hopefully later today. I’m Back from My Blogger Break! I’m back from my blogger break, and doing well! Both tests went off without a hitch, so the hours of studying were definitely worth it. Anatomy Test was over Muscles, Bones, and Nerves. Nutrition was over Healthy Lifestyles, Sports Nutrition, and Eating Disorders. So, a lot of really good material all crammed into one week. But it’s worth it. I have class tonight, and then we get a full week break next week for July 4 Holiday! Yeah for a much needed break! Saturday: I was quite pleased. I was only 2 grams over on carbs and 1 gram over on fat, but still within calorie and protein ranges, and I got a lot of vitamins and minerals today. Plus, I worked out and did a lot of studying. Breakfast was 4 oz. 2% organic milk, 1 mini spinach-bacon-mushroom quiche, 1/3 c. blueberries, and 1/3 c. strawberries with 1 tsp. of raw sugar, and 2.5 c. of coffee with skinny caramel creamer. Lunch was another slice of quiche and a bowl of leftover broccoli soup. I had 2 c. of kale with 2 Tbsp. of organic ketchup for a snack. Dinner was 1 c. grapenuts cereal, 1/3 c. blueberries, and 1 c. blueberry kefir (a yogurt drink). Sunday: Yeah for thinking ahead. I know we have plans to have pizza with friends tonight, so I’m planning ahead to balance out the day. I was well within every range except for being a little high on protein, but not too excessive. Breakfast: 1 slice quiche, 1/3 c. blueberries, 1/3 c. strawberries, and 1 c. coffee with skinny caramel creamer again. Lunch: 3 oz. pork tenderloin, 1 c. mashed potatoes, 10 asparagus, 2 sliced roma tomatoes. Dinner: 2 slices cheese pizza, veggie tray (carrots, cucumbers, and red pepper strips) with a Tbsp. of hummus, and blueberry salsa (recipe to come) with low-fat, baked tortilla chips. Okay, I also had a piece of cookie bar, but I was still within ranges. There are so many things going on in my head and heart recently, so I wanted to put a few of them out there. There may be some “stream of consciousness” style going on here, but I’m just trying to put it all on one page and see a big picture emerge. I’ve been using the NLT (New Living Translation) for my personal reading recently and it’s been a joy to read and see things in a fresh way. So, the passages quoted below are from the NLT (underlining is mine). Proverbs 11:12 says, “…a sensible person keeps quiet” (compared to the gossip in v. 13). Proverbs 31 speaks of the capable woman. She is trustworthy (v. 11), rises early, cooks, and plans ahead (v. 15), is “energetic and strong, a hard worker” (v. 17), works late into the night (v. 18), “extends a helping hand to the poor and open arms to the needy” (v. 20), and even sews (v. 21-22). “She is clothed with strength and dignity, and she laughs without fear of the future” (v.25). She watches her mouth (v. 26), her pocketbook (v. 27), and her children (v. 28). And most importantly, she “fears the Lord” (v. 30). I’m in school to become a personal trainer, so no surprise that a future career change is in my future. And though it’s exciting, every transition comes with a risk. I’ve been working at the same company for five years, have pretty decent benefits and enjoy what I do. I also love the people I work with! Change is scary, but it’s inevitable (though I’m not exactly sure when yet). So the verse about keeping my eyes focused and not getting sidetracked is something I need to keep before me. Long term goal? I want to be able to work part time from my home as a personal trainer or life coach (may even write for a Nutrition or Fitness magazine or website), publish my own cookbook, and be a stay-at-home wife and mom. All in good time. I know, I know, I’m not getting any younger, but you’re only as young as you feel. And I feel about … 23 (even though I’m almost 6 years older than that). I’m taking care of myself and I believe God is in complete control. So, don’t worry, we want kids. But we want them in God’s timing. So, if it happens, it happens, and if it doesn’t,…I would love to adopt! All I’m saying is I don’t know exactly what God has in store, but we have some desires, and we believe those to be God-given, so we’re taking steps to get to the goals we think He has for us. Another long term goal is to help with a church plant somewhere. There’s a church in Colorado that’s just starting up and we have several friends that either are already out there helping it or are moving soon. We’d love to be a part of this, but we know that 1. we need to find jobs, 2. we need to sell our house, and 3. we need to be content until God says go. For now, I’m in school. After this semester, we’ve decided that I’m going to try to do the self-study method to get my personal trainer certification. Eyes on the prize: certification! As another step in the process, I’d love to work part-time for a gym and learn the ropes of running a fitness studio under a certified trainer. So, is Colorado a possibility? Sure, but not for another year or so, most likely. If I can find a job in a gym and get one year under my belt while getting certified, that will help me find a fitness job if we get to move. And if we don’t move, then I still want to work for a personal trainer while becoming one myself. God knows. He’s had it all mapped out long before we were ever born. Meanwhile, my personal goals are to 1. be a godly woman (which means focusing on God first and foremost, watching my mouth, watching our money, planning ahead, and being as generous as we can be), 2. be a fit wife (physically fit and one that nurtures my husband), and 3. become a certified trainer. If I focus on a heart that pleases God, I honestly believe the rest will fall into place. So, I choose not to fear the future, but instead to “laugh” and fear God instead of fearing the future, like the woman in Proverbs 31. I choose to be joyful, gracious, and generous. And though my steps may falter along the way, God has prepared my steps and will continue to guide us each and every day. “Preheat oven to 300°F. Rinse and dry the kale, then remove the stems and tough center ribs. Cut into large pieces, toss with olive oil in a bowl then sprinkle with salt. Arrange leaves in a single layer on a large baking sheet (I needed two because mine are tiny; I also lined mine with parchment for easy clean-up but there’s no reason that you must). Bake for 20 minutes, or until crisp. Place baking sheet on a rack to cool. Kale - Remove leaves from stems and rip into bite size pieces. This is two bunches. I reserved half of it to try again or in different recipes. Dry leaves and place in bag. Drizzle with 1 Tbsp. of olive oil. Add some salt, close up bag and shake (careful not to add too much salt). Preheat oven to 300F. Spread kale evenly on baking sheet. Bake for 20 minutes or until crispy. Overall, this was pretty good. I got a little too much salt on mine, but the ketchup helped balance it out. Do make sure to dry the leaves well so they crisp up. (PS, I also tasted it raw. It had the texture of curley parsley or arugula and kind of tasted like broccoli. I may try adding it to a smoothie in the morning. I noticed it was an ingredient in several of the smoothie recipes I’ve seen recently. And it’s in the Bolthouse Farms Green Goodness smoothie that I like so much, so it’s worth a shot.) Thanks for the recipe, Katie! Nutrient Analysis Project: Do You Need a Multivitamin? Record your food and drink intakes for a 24-hour period (include amounts: for example 1 cup cereal, 1 tbsp jelly, 3 ounces chicken). Go to http://www.mypyramid.gov, scroll down to the right to My Pyramid Plan and enter your personal information to get a personalized calorie (kcal) level to use for this assignment. For this project, we had to look up Energy (kcal), Protein (g), Carbohydrates (g), Fiber (g), Total Fat (g), Saturated Fat (g), Cholesterol (mg). There is not a DRI (Dietary Reference Intakes) for fat or cholesterol, but there are recommendations. For cholesterol use 300 mg as your max daily allowance. To get your fat gram recommendation, calculate 30% of your calorie level for fat grams. Then 10% of your calorie level for saturated fat grams. Remember, there are each fat gram yields 9 kcals. So, divide your total calories by 9 then multiply by 30% (.3) for fat and by 10% (.1) for saturated fat. Use the USDA nutrient website to look up foods and get their information: http://www.nal.usda.gov/fnic/foodcomp/search/. Do not just use food labels because that will provide incomplete information! When using this website pick Vitamin A content in mcg RAEs – NOT IUs (RAE = Retinal Activity Equivalents; IU = International Units). Add up your total intakes and compare your intakes to the recommended intake (DRI). Calculate your % DRI to see if you met your needs. To do this, divide your intake by the DRI and multiply by 100. For example if you consumed 65 mg vitamin C and the DRI is 90 mg then your calculation would be: 65 / 90 = .72 x 100% = 72% which means you were 38% below the DRI recommendation. Breakfast: 1/2 c. blueberries, 1 c. strawberry soup, 1 c. coffee with 1 tsp. each of sugar and 1 tsp. of non-dairy powdered creamer. Snack: 1 medium red pepper, 1/3 c. homemade hummus. Lunch: 1 serving chicken pot pie, 1 plum. Dinner: 1 c. medium grain white rice, 1/2 c. black-eyed peas, 1 tab of butter. Snack: 1/2 c. vanilla ice cream. Calcium: 35.2% of DRI. I try to avoid an excess of dairy, so I may need to take a calcium supplement or consider calcium fortified orange juice. That or I can add a yogurt for breakfast. Vitamin E: Only at 34.6%. My multivitamin yields 30 IU, which is basically equivalent to the RDA. I could also eat a bowl of raisin bran or have 1 oz. of sunflower seeds or almonds to naturally increase this level. Magnesium: Only at 50.50%. My multivitamin adds 50 mg, but that still only brings me up to 63% of DRI. I should add a few tablespoons of peanut butter, an ounce of sunflower seeds and some extra spinach as good sources of magnesium. Folate: 94.75%. Pretty good. And I take a vitamin supplement that has 400mcg of Folic Acid on top of that. Vitamin B12: Only at 30.83%. Only found in animal products, which I don’t eat a ton of. However, my multivitamin adds 6mcg, which is almost 3 times the DRI. Adding a yogurt or a boiled egg as a snack would help, since B12 only comes from animal products. Iron: Only at 63.25%, however my multivitamin does provide 100% DRI in addition to this, so I should be fine. Spinach would also help here. Zinc: At 69.63%, however my multivitamin provides almost 2 times the DRI. If I add the yogurt and sunflower seeds, this level will also go up. Vitamin C: 422.27% – 1 red pepper has twice the DRI of Vit C. Still didn’t come close to toxicity levels. UL is 2 grams, so I’m still far within allowed amounts. Niacin: 147.39% – limit portion size of poultry. I consumed 20.6 mg of niacin, which is still 15 mg under the UL. Vitamin B6: 130% – a little high, but fine. I consumed 1.69 mg. UL is 100 mg per day, which I am far below, so this is not of concern. 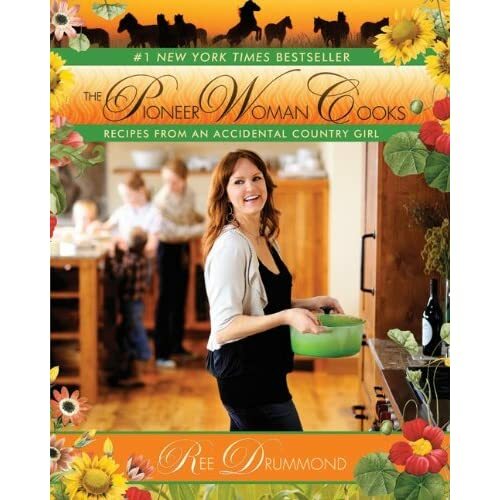 The Pioneer Woman Cookbook – 25% off all books at Ingles! Can you believe that Ingles gives 25% off ALL books if you use your Ingles Advantage Card?! They had the Pioneer Woman Cookbook, which I’ve been wanting. I picked it up 3 times, then saw the sign posting the 25% off discount and picked it up for the final time to put it in my cart. Yeah! Beautiful pictures! And it’s an inspiration for me to keep writing my own cookbook – one of my life goals. 🙂 It’s also on sale at Amazon.com for $16 or $17, but if you don’t have $25 to order to get the free shipping (or just don’t want to wait, stop by your local Ingles and pick it up! Who would’ve thought a grocery store would be a bookstore too!